5144 ✉ 41b,U13A 10 Pfg. Dark rose red, having bright colors outstanding quality as additional franking on postal stationery cover 10 Pfg. 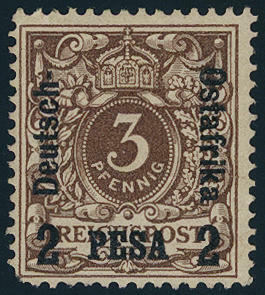 Crown / eagle with perfect postmarks \"LAMU East Africa 30.1.91. 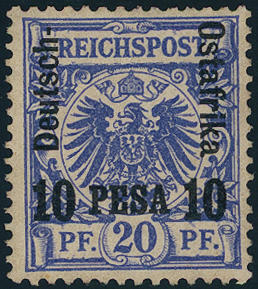 \" with routing indicator \"PER S. S. BARAWA\" and on the back violet senders mark \"German WITU society LAMOO east Africa\" to Berlin with arrival postmark. Entire pieces from Lamu are general very rare, whereby it be here about a particularly beautiful and attractive mixed franking of two different of the same value-level issues act. A Honor for the sophisticated collection! Expertized Bothe BPP. 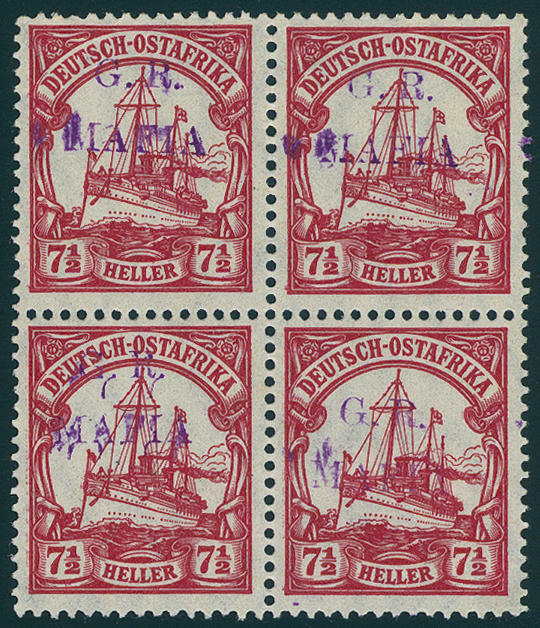 5175 3b 7 ½ H. Carmine red with blackish purple overprint \"G. R. Maffia\" block of four, wonderful fresh colors and very well perforated, in perfect condition mint never hinged in excellent condition. A very decorative and scarce unit! Expertized Buehler. 5176 6b 30 lighter carmine / black, block of four with black violet overprint \"G. R. Maffia\", fresh colors and in perfect condition unused with original gumming. By of the right lower stamp fells the overprint a little feebler from, therefore got this to the confirmation the signature \"JDM\" of the Military Governor Lieutnants Colonels \"J. D. MACAY\". There are very few examples of this kind have become known. A rarity of the British occupation maffia. (Gibbs handbook no. 6 C and 6 approximate). Photo expertize Buehler. 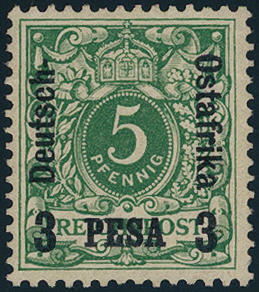 5177 22 12 ½ lighter pale brown, fresh colors with blue green overprint \"O. H. B. M. S. Maffia\" and handwritten used date from 1916, unused. Rare! 5162 ✉ 3I 5 Pesa on 10 Pfg. Crown / eagle, two examples fresh colors and in perfect condition on very nice small-format cover with British two ring cancel \"ZANZIBAR 20. MY. 96. \" and additional rectangle cancel \"Paquebot\" (Hosking catalogue no. 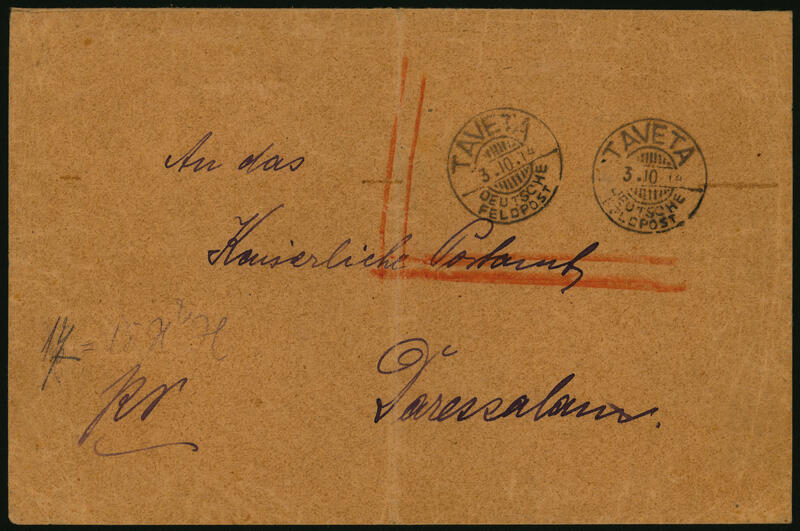 2921 C) from the first year the use, to Eisenach with on the back transit cancellation \"ADEN 2. JU. 96. 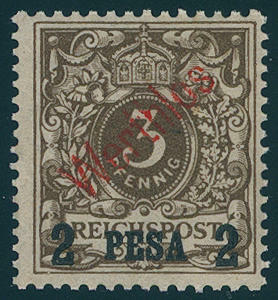 \" and arrival postmark \"Eisenach 14.6.96. \". 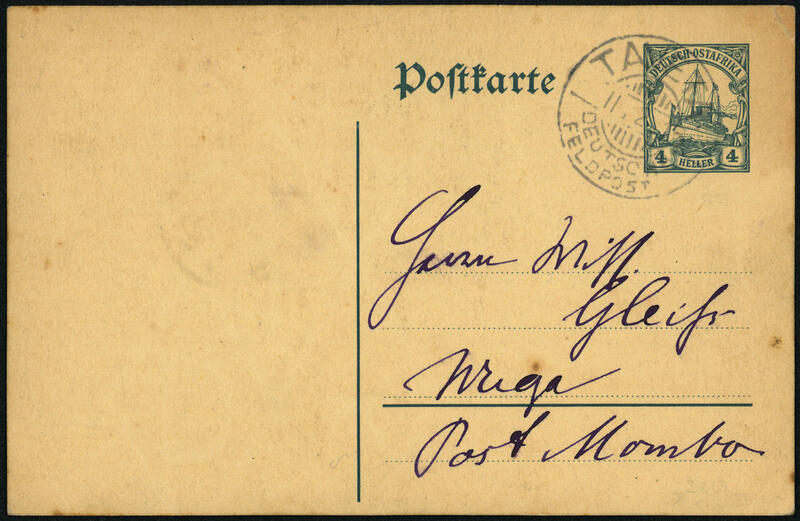 A fantastically beautiful letter, which was not posted at the German post office, but directly on the ship. Extraordinarily decorative and rare! 5163 ✉ \"KISAKI 8.12.95\" with inverted day specification, razor-sharp on gef. 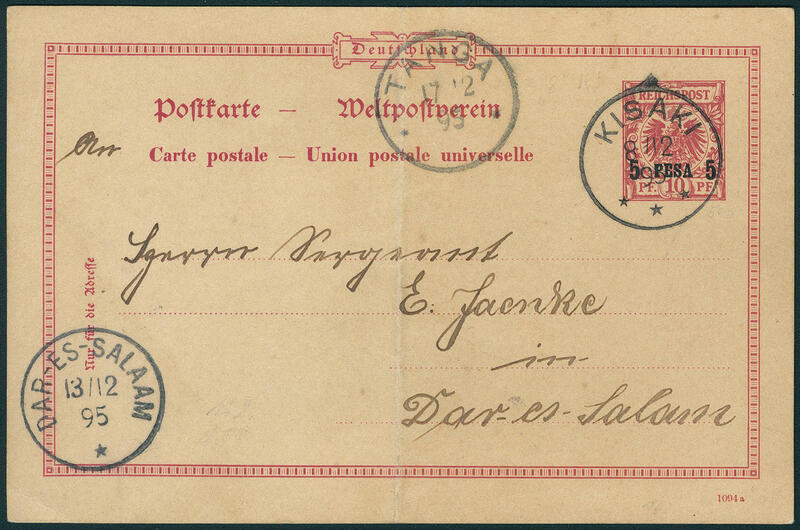 Postal stationery 5 Pesa on 10 Pfg., to the international tariff franked, to Daressalaam respectively Tanga with transit stamp. 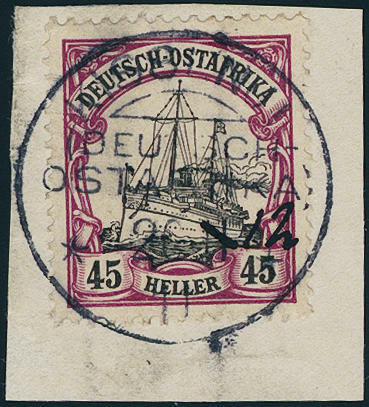 The cancellation from Kisaki is by far the rarest town cancel from German East Africa and a significant rarity of the German colonies. There are very few documents from this known! The document offered here was first auctioned in 1955. Photo expertize Jäschke-Lantelme BPP. 5164 ∆ \"KISSENJI 20.11.11. \" with handwritten amended month indication in 12, perfect centric and razor-sharp on white letter piece with 45 lighter ships. A dreamlike beautiful copy this cancellation rarity for the highest standards! Photo expertize Jäschke-Lantelme BPP. 5165 ✉ \"NYEMBE-BULUNGWA German east Africa 15. Oct 1912\", the scarce private stamp of origin razor-sharp on very nice, commercially related postal stationery 4 Heller, written of the Usumbaw-Companie in Nyembe-Bulungwa, the postage stamp impression with postmark \"TABORA 19.10.12. 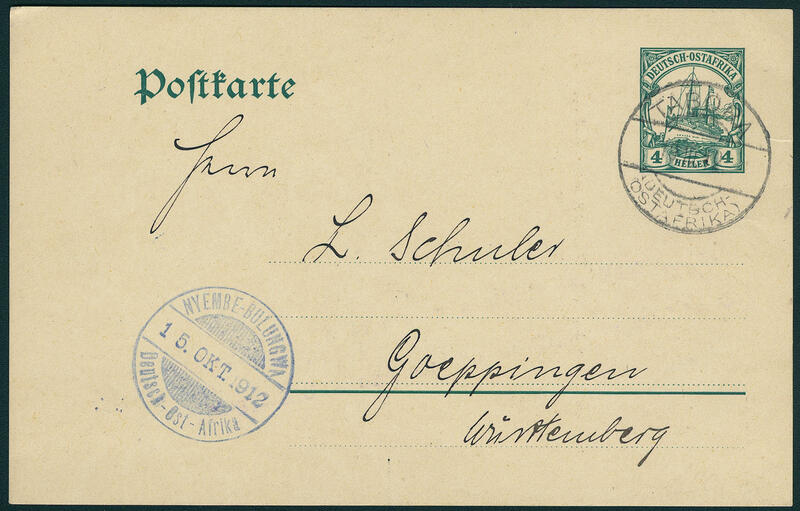 \" to Goeppingen / Wuerttemberg. 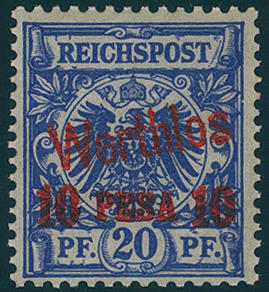 A wonderful document this sought-after cancellation in outstanding quality. 5166 ✉ P23 \"TAVETA German army postal service 11.2.15\" clear on requires moderately related postal stationery (Michel no. P23) with interesting text to Wuga / post Mombo with arrival postmark on the back \"MOMBO German East Africa 3.2.15\". A scarce legitimate postcard, the not as army postal service was transported. In this kind are only a few copies became known! 5167 ✉ Mail exchange from 1917: POW card with handwritten notation \"P (PRISONER) OF was letter\", dated from 8.4.1917 with handwritten notation \"through peace envoy\" with German text in the British occupied Amani with violet British censorship stamp \"PASSED CENSOR C. E. A. 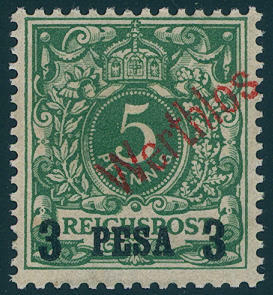 \" and handwritten German censorship \"CENS\" in green. 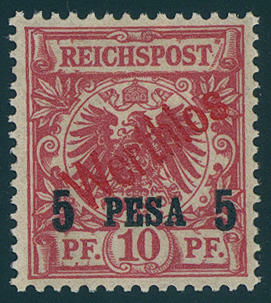 During the acts of war in German East Africa came it multiple to a mail exchange through Military couriers between German and Britons. The respective cards and covers were normally mutually censored. 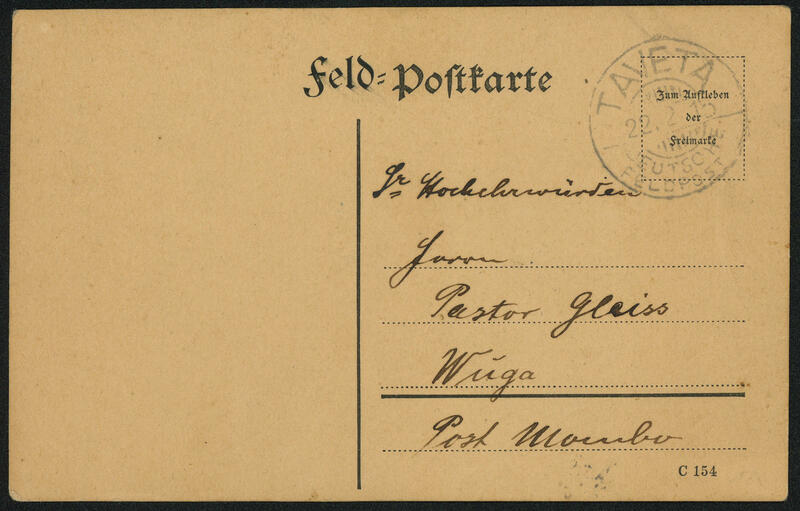 These POW card from the last but one war year counts to the large war mails rarities from German East Africa! Photo expertize Jäschke-Lantelme BPP. 5168 ✉ \"TAVETA German army postal service 3.10.14\", twice clear on gef. Post paid articles of mail cover to the Imperial post office in Dar es Salaam. 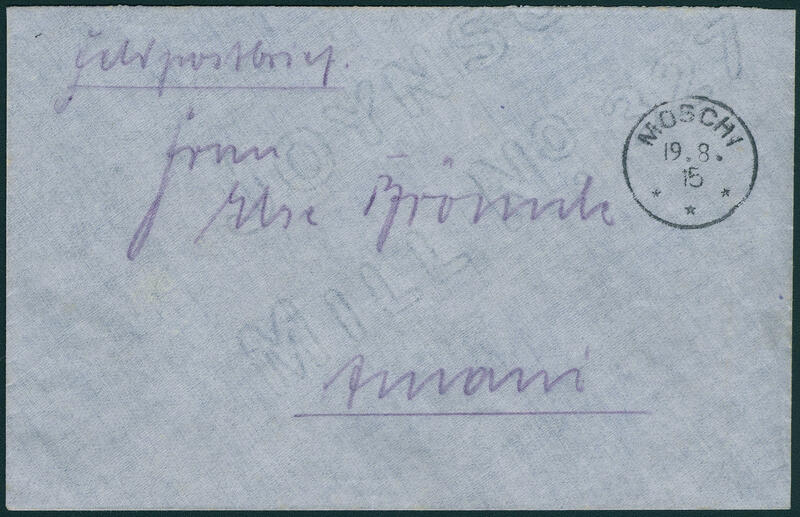 An extraordinarily scarce utilization of the fieldpost cancel! Expertized Dr. Steuer. 5169 ✉ 10 Pfg. 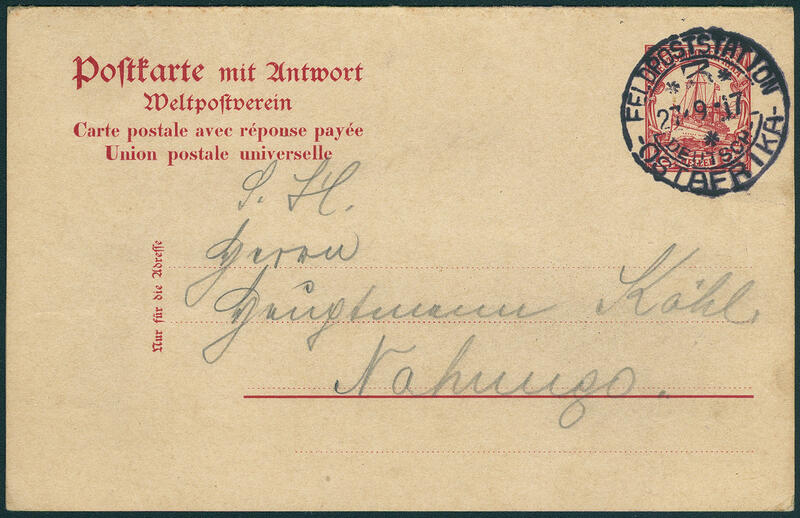 Germania, postal stationery with two ring cancel \"LEIPZIG 16.9.15. 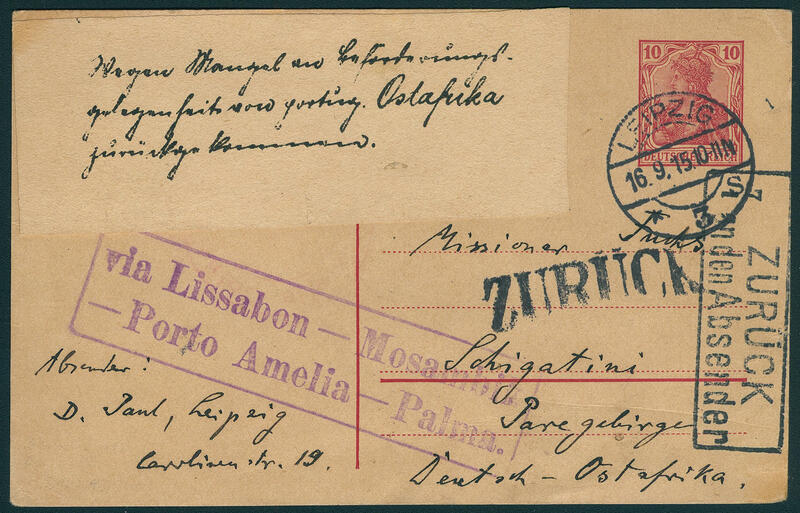 \" to Schigatini / German East Africa with violet rectangle cancel \"VIA LISABON / MOCAMBIK/PORTO AMELIA-PALMA\" and adhesive label \"because lack at transport facilities from Portuguese East Africa returned\", as well large return stamp and rectangle cancel \"return to sender\". 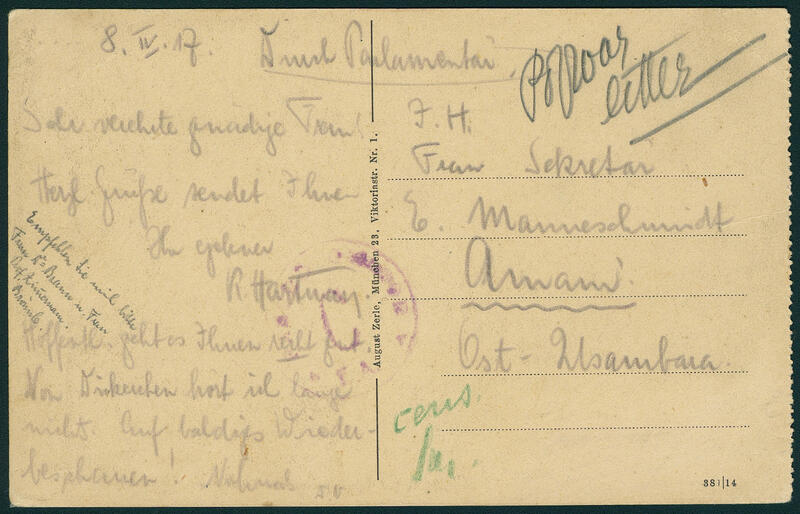 An impressive war mails rarity, of which only a few documents have become known! 5170 ✉ \"TAVETA German army postal service 22.2.15\" neat on field postcard (form C 154) to Mr. Minister Gleiss Wuga / post Mombo. Sender adress was a member the 19. Field company in Taveta. A very nice war postcard with interesting text! Expertized Seven step BPP. 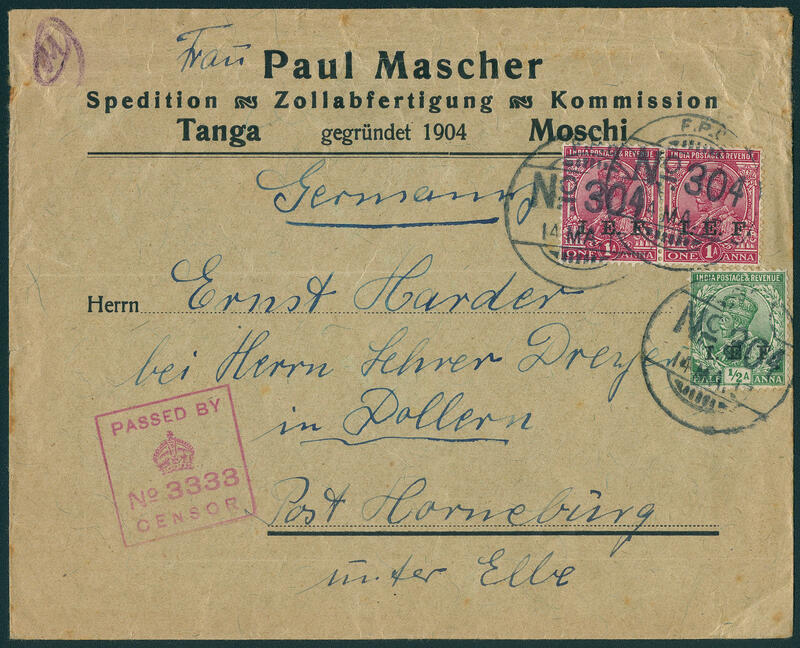 5171 ✉ \"MOSCHI 19.8.15\", clear on very nice fieldpost letter from the second war year at Fr. Else Brönnle in Amani, expertized Seven step BPP. 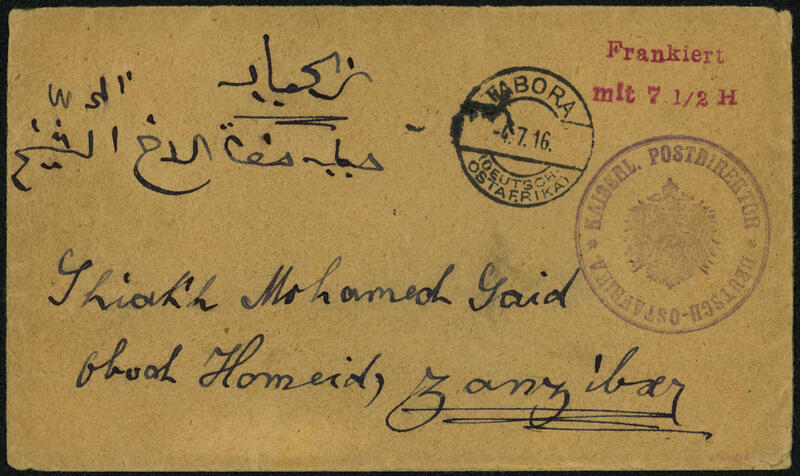 5172 ✉ VU1a 7 ½ H. Red, prepaid cover, Morogoro-edition with violet seal of office, three sided opened, clear two ring cancel \"TABORA 4.7.16\" to a native in Zanzibar. 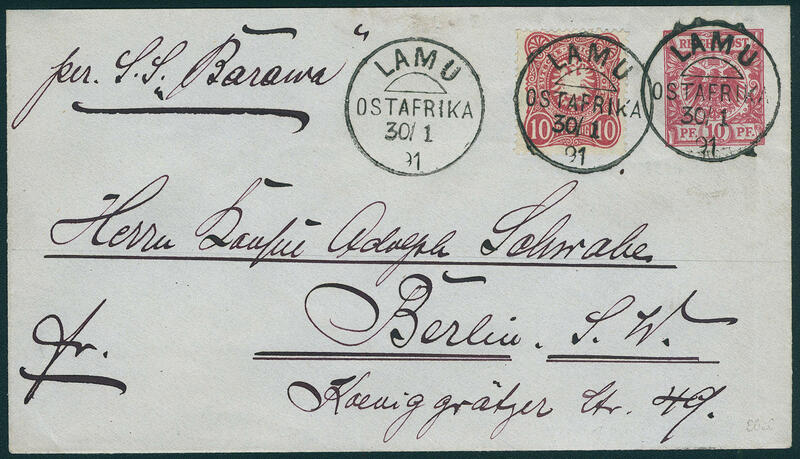 Prepaid covers, which have not been sent to Germans are rare, with the destination Zanzibar extremely unusual! 5173 ✉ India ½ A. And 1 A. In the horizontal pair with overprint \"I. E. F. \" on commercially used company printed form letter from Tanga with posting stamp \"F. P. O. No. 304 14. MA. 17. \" to Dollern / post Horneburg. The cover with as usual traces of usage, as well clear red censorship stamp \"PASSED BY CENSOR No. 3333\". 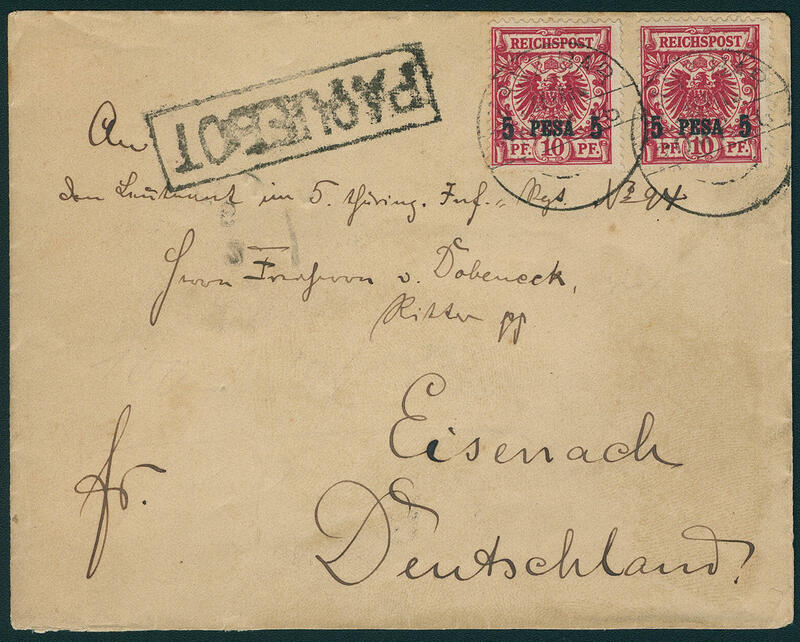 An extremely rare cover from German East Africa, the with British Indian army postal service was transported! 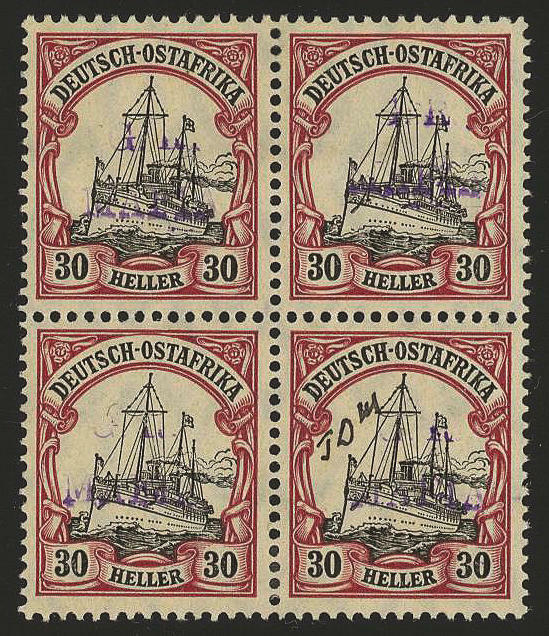 5174 ✉ 7 ½ lighter imperial yacht, double postal stationery with neat postmark \"fieldpost station office 3 German East Africa 27.9.17\", clean commercially used with a lot of text, written in Liwale, addressed at Captain Köhl in Nahungo. A particularly beautiful and rare war postcard with of this rare cancellation. Photo expertize Steuer BPP. 5145 1/5Essay 3-50 Pfg. 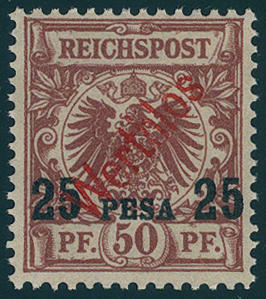 Crown / eagle, the complete set from five values as essays with vertical overprints \"German East Africa\" and the corresponding new denomination value \"2 PESA, 3 PESA, 5 PESA, 10 PESA and 25 PESA\", ungummed, the Michel no. 1 left at the bottom round corner, otherwise in perfect condition. 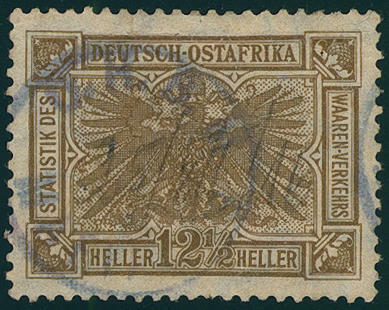 Because the overprint on of the first issue from German East Africa only from the indication of currency inventory, should on the next issue also the country name in the overprint appear. For these purposes were of the Empire printing office 10 mixed order that designed and partly in different colours presented. Complete sets hereof to class among the large rarities of the German colonies! Photo expertize Jäschke-Lantelme BPP. 5146 VK 1/5Essay 3-50 Pfg. 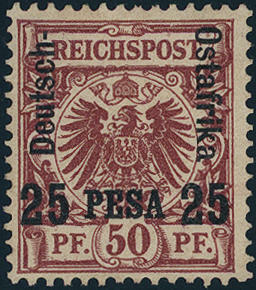 Crown / eagle, the complete set from five values with horizontal overprint \"German East Africa\", as well the new currency designation \"2 PESA, 3 PESA, 5 PESA, 10 PESA and 25 PESA\" on specimen cardboard, two values minimal insignificant faults, with handwritten notation \"German East Africa II. Edition essays. \", a significant rarity of the German colonies and at the same time a Honor for the advanced special collection! Photo certificates Georg Buehler, Jäschke-Lantelme BPP. Due to missing offers in the Michel special catalogue only noted without price! 5147 1/5Muster Postage stamps set 1893, all five values fresh colors, without gum, in each case with red hand stamp overprint \"WERTHLOS\". As well is the overprint \"10 PESA 10\" on the 20 Pfg. In red executed, at the 25 Pesa on 50 Pfg. Is the overprint \"PESA\" in clearly smaller Characters. 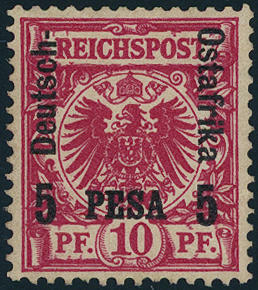 The set comes from a specimen sheets of the Archivs the Federal Printing Office (former Empire printing office in Berlin). This was 1996 public auctioned. Colonial rarity in perfect condition! Photo expertize Steuer.